New information confirms that MAX is similar to the NG, that the AoA analog interface is connected to two different computers, the Stall Management Yaw Damper (SMYD) and Air Data Inertial Reference Unit ADIRU) (which supplies the Flight Control Computer (FCC)). The SMYD uses AoA for Stall Warning and is evident by activation of Stick Shaker. FCC hosts MCAS, and if AoA from ADIRU too high it can trigger MCAS. The significance is that both SMYD and FCC responded to AoA large bias on JT043/JT610, and therefore, the AoA sensor must have been producing that erroneous output. The AoA sensor is what failed. 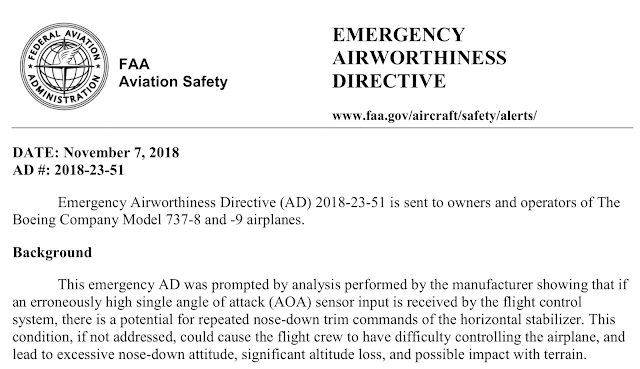 Boeing has confirmed that AoA disagree Alert will become basic, that AoA disagree will inhibit MCAS from triggering, and that MCAS cannot issue more than one trim command without AoA recovery. The Senate grilled FAA acting Administrator Dan Elwell over excessive delegations and allowing Boeing to sell "safety critical items". Elwell stumbled on some key points, notably describing the 737 MAX as Fly-By-Wire and that the aft column cutout switch can stop MCAS trim commands. Both Boeing and the FAA continue to insist that MCAS "runaway" is easy to detect and simple to respond to, but neither of these claims align with observations. The Seattle Times reported that the development of MCAS was limited to features that would not jeopardize differences training, including any new warning light. “A single point of failure is an absolute no-no,” said one former Boeing engineer who worked on the MAX"
"Rick Ludtke, a former Boeing engineer who worked on designing the interfaces on the MAX’s flight deck, said managers mandated that any differences from the previous 737 had to be small enough that they wouldn’t trigger the need for pilots to undergo new simulator training." "He said that if the group had built the MCAS in a way that would depend on two sensors, and would shut the system off if one fails, he thinks the company would have needed to install an alert in the cockpit to make the pilots aware that the safety system was off. And if that happens, Ludtke said, the pilots would potentially need training on the new alert and the underlying system. That could mean simulator time, which was off the table." 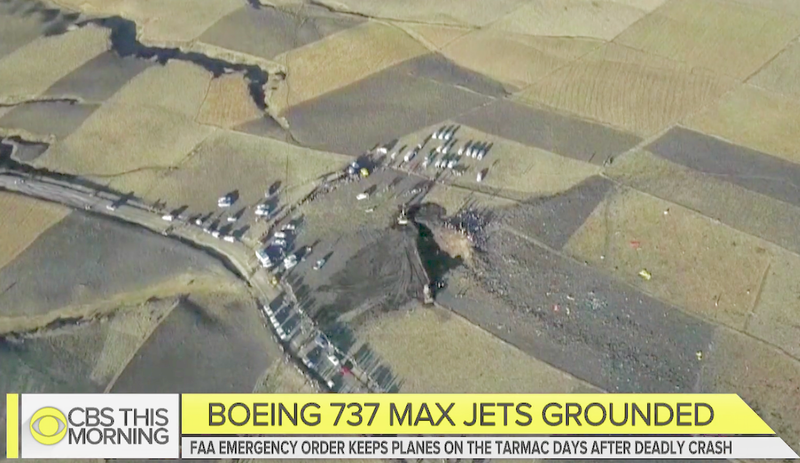 "Matt Menza, a former Boeing pilot who worked on the MAX, said that during flight testing of planes ready for delivery, he wasn’t aware of any events that indicated a problem with the stall warning or the MCAS system. But he said an ideal system would have been built on two angle-of-attack probes, so that a single bad value wouldn’t cause problems. Menza and two other pilots who have worked on the MAX said they were unaware that the system used only one AOA probe." Little new information has been released offering any specific detail on the events regarding ET302, except vague statements of similarities to JT610. 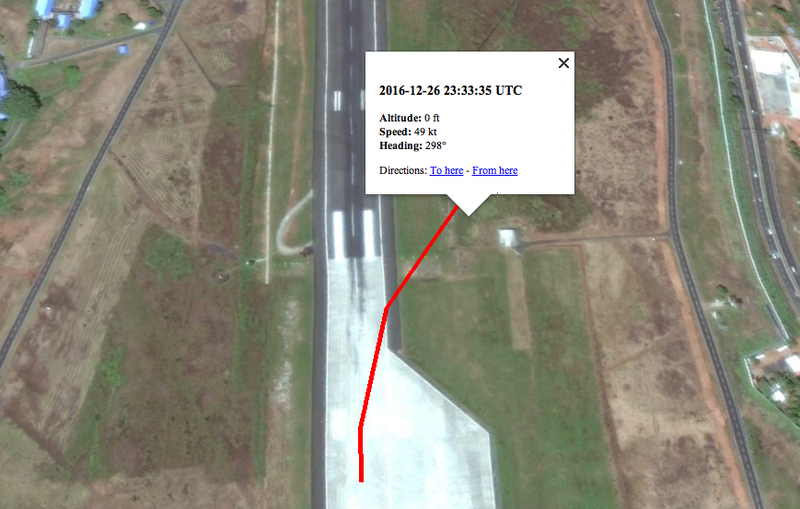 It has been reported that a flight observer on JT043 identified the stabilizer cutout as a corrective measure. 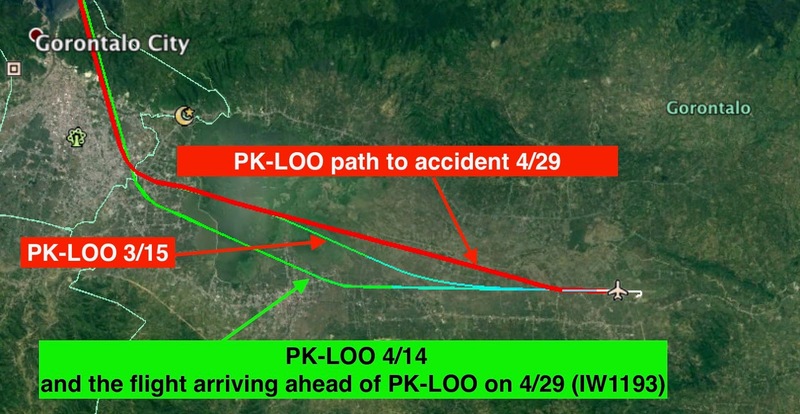 Further, it has been reported that the crew on JT610 were calm and methodical in trying to identify the source of their difficulty, and that control was lost shortly after the First Officer took over. This last point confirmed my thoughts from examining the flight data back in November, where it looked like the column forces had been transferred just prior to the final MCAS trim commands. The crash of Ethiopian ET302 brought a tragic beginning to what must be one of the worst weeks in aviation, ending with the grounding of the Boeing 737 MAX. What does Lion Air JT043 and JT610 teach us? Did we, as an industry do everything we should after JT610? Accusations of impropriety levied at Boeing and the FAA seemingly are always on the ready. Adding to the week was an update on Atlas 5Y3591 which at first seemed to be one thing, but with a slight wording change thankfully seems to be another altogether. Did Ethiopian ET302 succumb to the same situation as Lion Air JT610? The FDR and CVR data is being processed as I write this, with a public release in some form expected by Monday March 18. 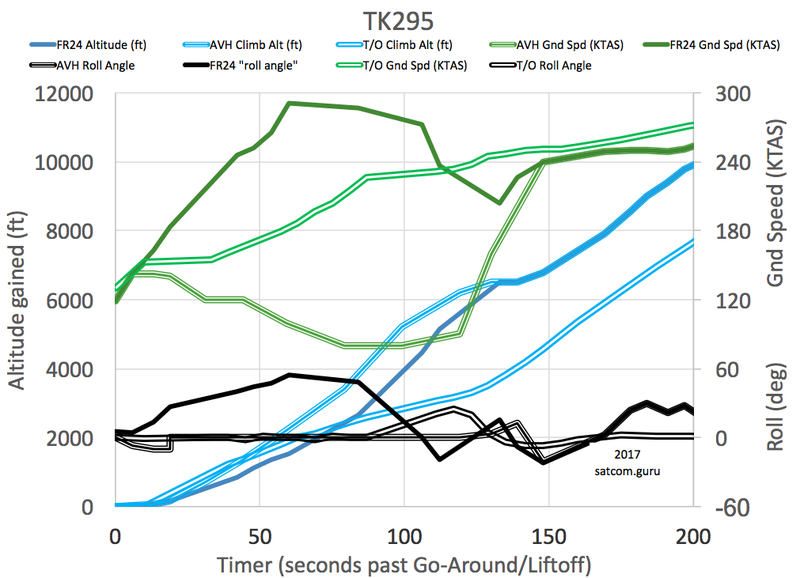 Aviation authorities have grounded the Boeing 737 Max before receiving a report from this recorder data. The only information to the public is from commercial ADS-B data brokers, notably Flightradar24.com, whose recording is incomplete. Aireon has shared space-based ADS-B data with several parties, but not to the public. Canada and the US make reference to the Aireon data as a factor in their assessment, with the claim that there were sufficient similarities to be concerned. The NTSB has revealed that Atlas Air 767 Freighter flight 5Y3591 dove based on nose-down elevator command. The nose was pushed over 49 degrees nose down. The engines were brought up to full thrust. There was no stall warning that preceding these actions. The dive reached 430 knots before impacting. Pitch attitude rose from -49 deg. to -20 deg. in the dive. 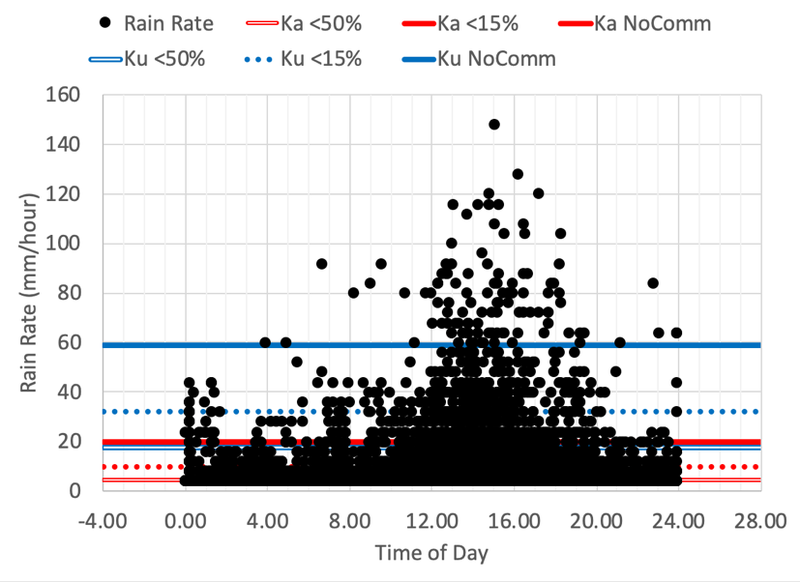 Rain Fade is a factor with Ku-band and Ka-band satellite communications. Rainfall rate is measured in mm/hour. The occurrence of significant Rain Fade events is scaled by the rainfall rate and its duration. Generally these events are transient as the rain cloud moves through. 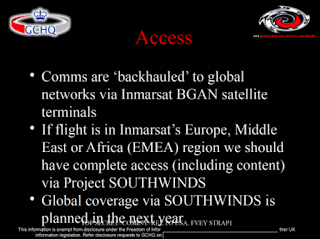 The path of interest is only the line from the satcom terminal to the servicing satellite. Only while the rain cloud is in the way do problems occur. Panama is in a very severe rainfall rate region and will create frequent issues with Ka band service operating below about 15,000 feet. Ku should operate through these scenarios with less disruption. It is prominent in the region along with the Brazilian rain forests and significant as a hub airport. When KHOU took a video tour of the collected wreckage, they included a frame of the stabilizer trim actuator (the jackscrew). Satellite radios produce powerful Radio Frequency (RF) emissions. 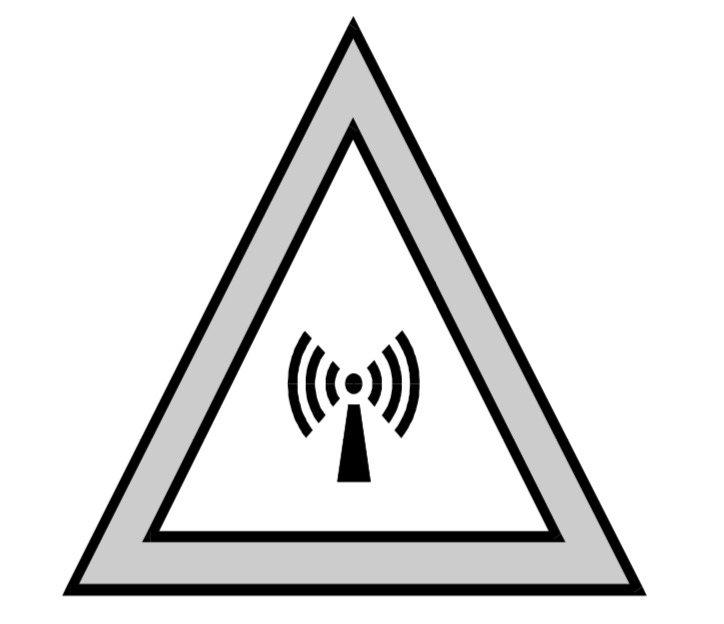 A method is provided for limiting the RF exposure to humans that are in close proximity to satellite transmitter antennas by establishing radial keep-out zones. 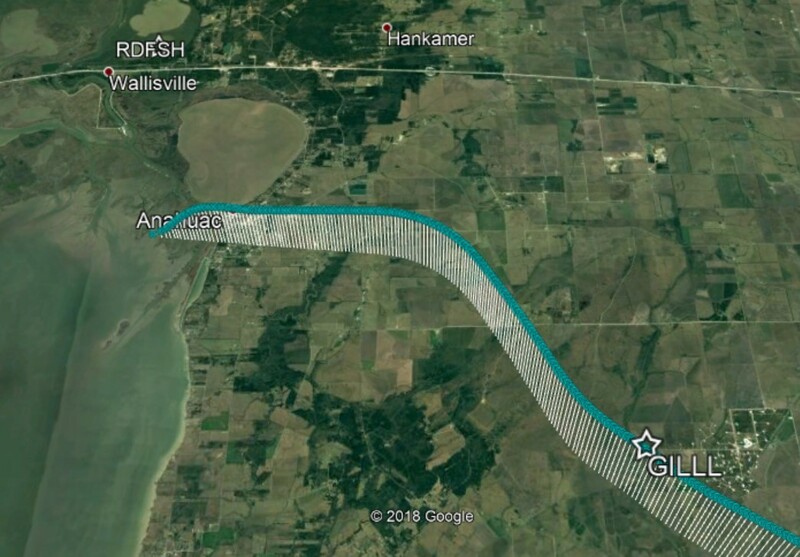 Atlas 767 flight 5Y3951 was descending for 3,000 feet when it appears to have briefly leveled off at 6,200 feet, before nosing over and plunging to the ground. NTSB chairman Sumwalt has seen video of the last five seconds to the impact of Atlas 5Y3591 and confirms it was in a steep, wings-level dive and made no visible attempt to pull up. The debris field is approximately 200 yards long by 100 yards wide in a NW orientation, consistent with the aircraft steep trajectory and high speed. The steep descent began with light to heavy rain in the area, from about 6,000 feet at 240 knots airspeed. 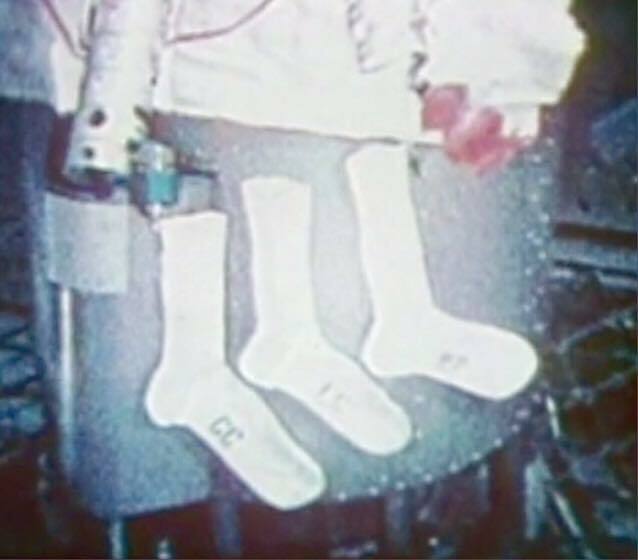 There was no communication from the flight crew after their routine approach. They were descending from 18,000 feet for 3.000 feet when the event occurred. Three Atlas Air crew members tragically perished when their 26 year-old Boeing 767 plunged from about 6,000 feet in about 10 seconds. The freighter had departed from Miami and was on approach to Houston (IAH). The crew made no radio call, and there was no warning or indication of difficulty prior to the pitch over. Lion Air JT610 Captain's angle of attack (AoA) measurement was about 20 degrees higher that the First Officer's AoA. The excessively high AoA value caused considerable flight deck effects, which may have been a principal factor in the catastrophe. Electrical and mechanical malfunction characteristics of the AoA transmitter are matched against observations. The most likely failure is mechanical in nature, influenced by air pressure, and fully internal to the AoA transmitter. A line is drawn between primary flight controls that the pilot handles directly through control column, rudder pedal, and stabilizer trim; and automatic control, such as the autopilot, which manages the same surfaces through computer command. 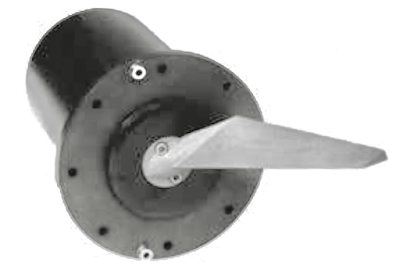 The Yaw Damper is an example of an automatic flight control system added to the airplane to augment flight characteristics. The Yaw Damper operates regardless whether pilot manual flight control or automatic flight control. 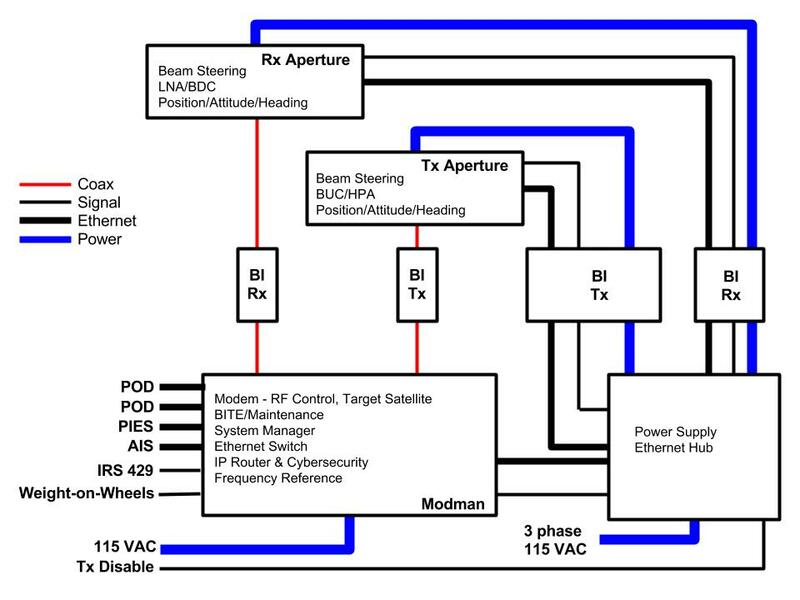 FCC Pitch Axis augmentation (Mach Trim, Speed Trim, and MCAS) commands may be based on a single sensor input. These commands should be checked against a calculation based on a second sensor set before becoming valid. A software update to the FCC may provide support for a dual channel mandate. The 737MAX introduced a new feature, Maneuvering Characteristics Augmentation System (MCAS). 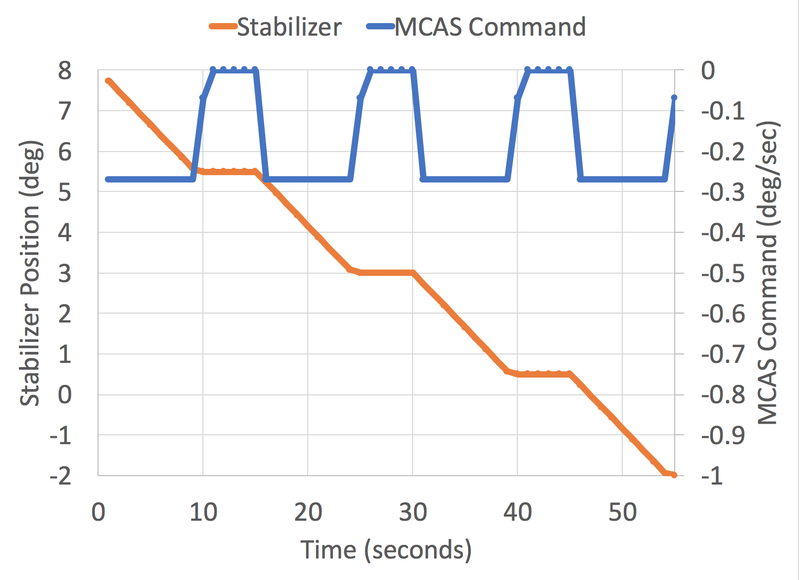 MCAS commands the stabilizer to trim down (only while flaps are up) in steps. From reports, the aft column cutout switch is disabled while MCAS is active. 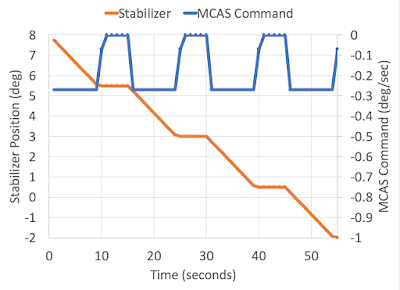 MCAS commands nose down trim at 0.27 deg/sec for about 10 seconds at a time. It then pauses briefly (duration not known, but presumed five seconds). The time history of a fabricated scenario, starting at a stabilizer position of 8 units, shows it would take about 55 seconds to reach the nose-down limit. Starting at a more nose down position takes less time, e.g from 4 degrees about 35 seconds). Airlines flying routes connecting European airports fly far enough north to limit satellite elevation to less than 45 degrees. Installing a Ku/Ka band satellite antenna in the Airbus-nominated position for A320 series creates a blockage from the tail (shadowing) that can extend more than 30 degrees in elevation and about 4 degrees wide. This combination can lead to loss of service when the airplane is flying directly away from the servicing satellite. The problem is made worse by using satellites that are not well situated. ADS-B OUT data broadcast coupled with machine learning can create a great enhancement to aviation safety. Flight Operations Quality Assurance (FOQA) was conceived as an anonymous means to reveal unsafe trends. The post-flight evidence would guide training and awareness, not personal vendetta. With ADS-B, the alerting can be done in real-time; the trends recognized as they are occurring. APEX EXPO 2018 got started a day earlier than I expected. My report from the first two days looking at VR headsets, satcom partnerships and agreements, seeking profit, and emerging technology. Panasonic and Inmarsat have jointly announced an agreement to work together. 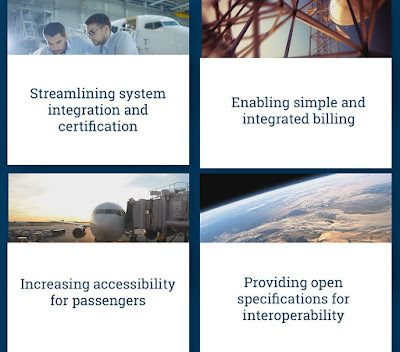 "Customer airlines will be able to select a product that represents the best that Inmarsat and the best that Panasonic offer together" declared Ian Dawkins, Panasonic Senior VP of Network Operations. "This is far more than a simple reseller agreement." 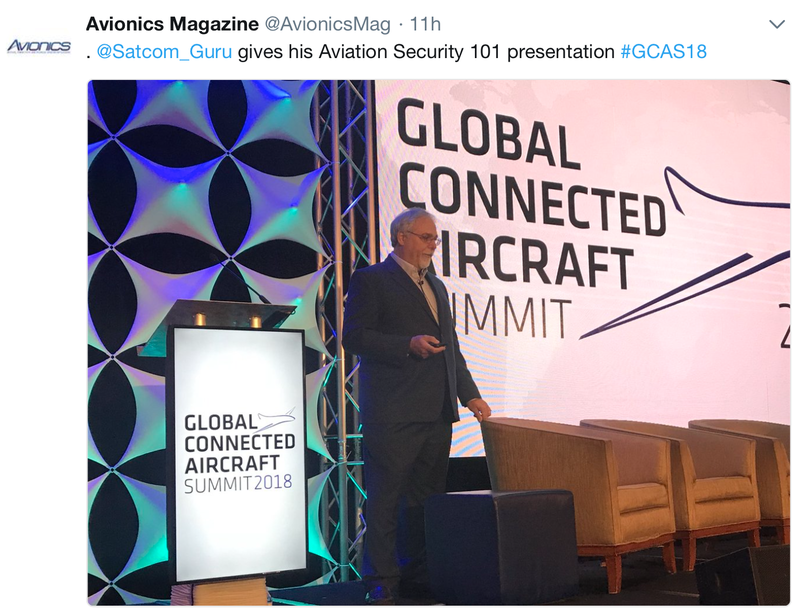 Thanks to Woodrow Bellamy III and Mark Holmes for inviting me to present at the Global Connected Aircraft Summit 2018. Here is my slide deck (with notes). 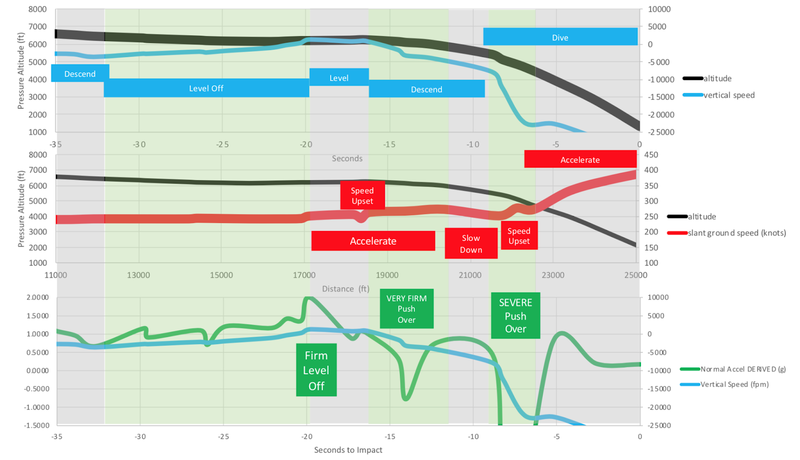 I have revised and added a slide to address how an iPad can host type B EFB messages. Joining final approach very late may have contributed to a Boeing 737-800 departing the runway 27 at GTO/WAMG Gorontalo Jalaluddin Airport in Indonesia at about 18:35:30L (10:35:30Z). 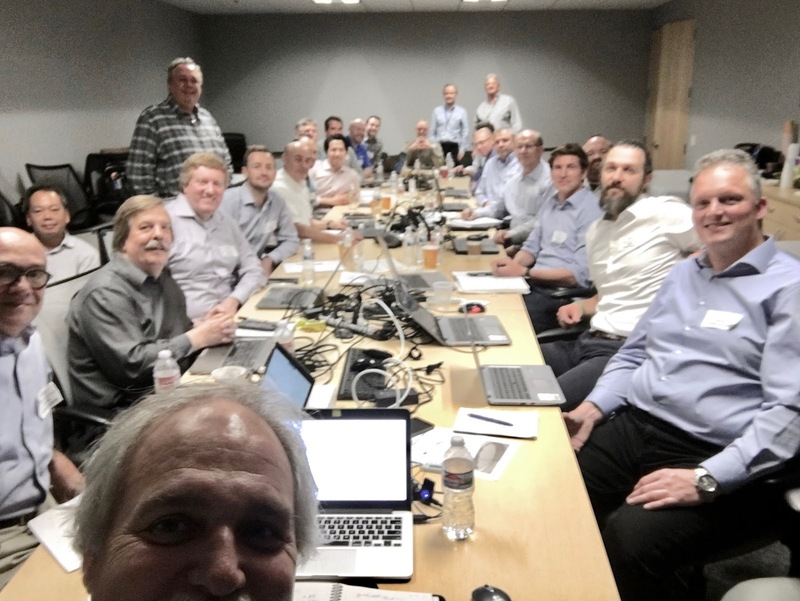 Seamless Air Alliance - Who Owns the Customer? Delta, Airbus, OneWeb, Sprint, Airtel, and Gogo announced the formation of the Seamless Air Alliance. Equipment, certification, satellite coverage, billing and overall service is included as a one-stop offering. A participating airline picks parts from a catalog, installs per a cookie-cutter, turns it on, and the passengers connect to the Internet. 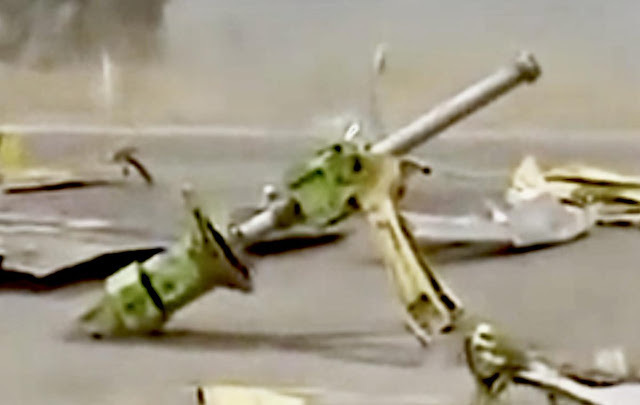 Ku/Ka-band Satcom Systems offer no safety functions. No failure of the satcom system should create an unsafe effect. Users of the satcom system do so at their own peril, as they would with any Internet access provider. Discovery of cybersecurity vulnerabilities should emphasize rapid response to close the threat and a cooperative approach to sharing information privately, with an agreement to share enough information publicly to raise awareness of best practices. Details and a checklist in the following paper. 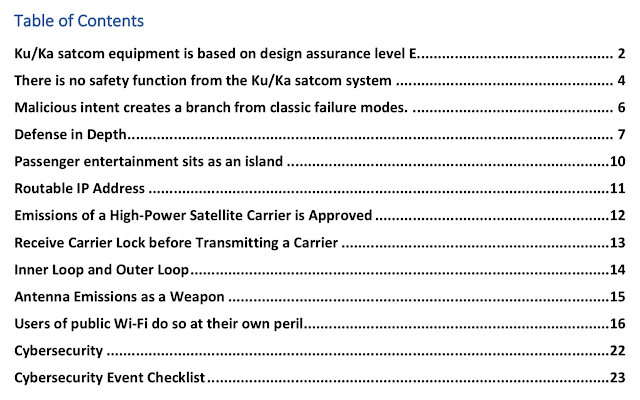 PP792 defines the form and fit characteristics of the Mark II Aviation Ku-band and Ka-band Satellite Communication (satcom) System, intended for installation in all types of commercial air transport aircraft. 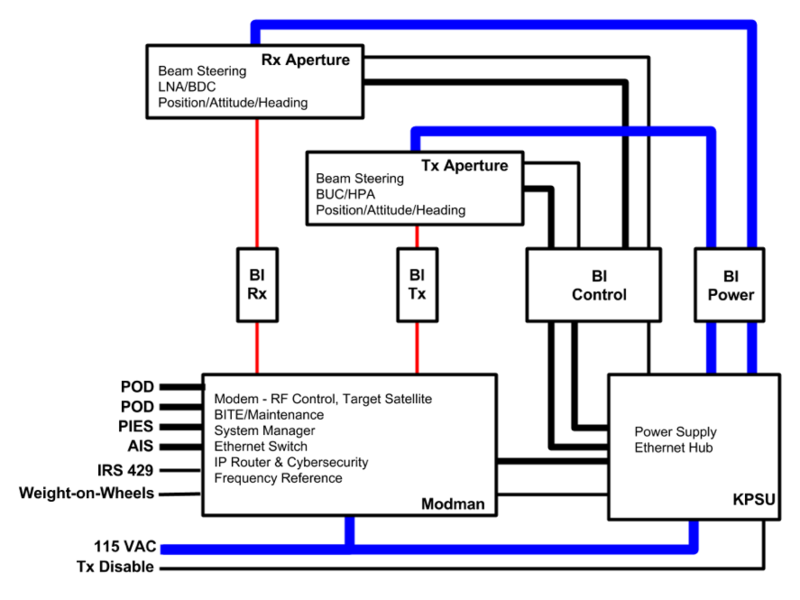 The satcom system described in PP792 represents the next evolution from the Mark I system defined in ARINC Characteristic 791, Part 1. Flexible lug pattern accommodates two apertures, each up to 42"
Is there Gold on Virgin America? It’s like walking into a night club. With a two hour telecon in Jan 2008, the SAE/ITC AEEC Ku/Ka-band Satcom Subcommittee started to work together. What ever happened? 10 years and 122 gatherings later, we are still at it! Here we are today @ThinKom_Inc. Equipment installed on aircraft must be designed and tested to be compatible with other equipment and with the airborne environment. 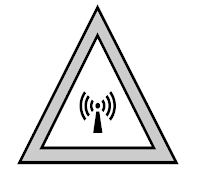 Notably, radio frequency (RF) radiated emissions from one system may disrupt other aircraft systems such as radio receivers or present hazards to human health. 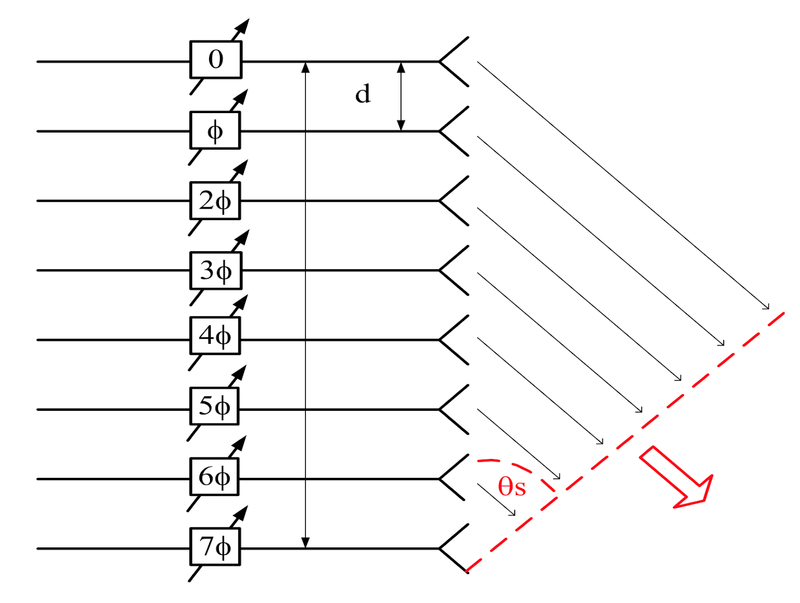 Flat-Panel antennas, particularly those with embedded amplifiers, provide the only pathway from an effective 18" aperture from a typical multi-gimbal antenna to as much as a 42" aperture. The first of these new antennas is the Gogo 2Ku made by ThinKom. 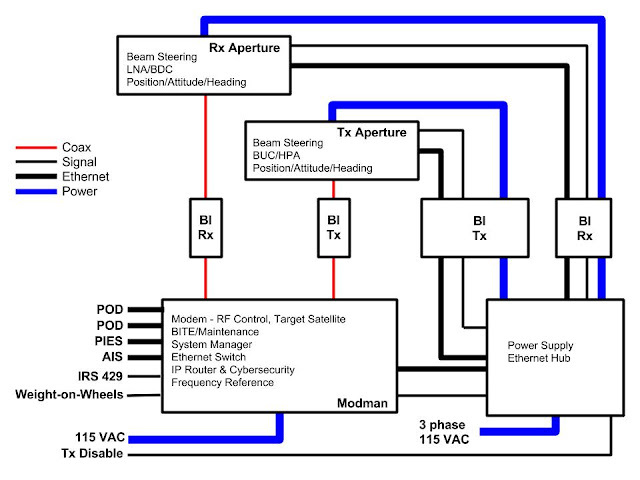 Project Paper 792 provides the form and fit of these second-generation satcom systems building on the baseline from ARINC 791 part 1 and using a common functional definition using ARINC 791 part 2 and Project Paper 848. 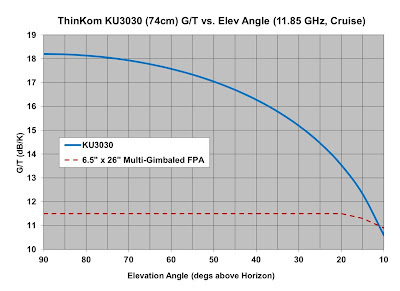 While it is possible to get 2x as marketing touts, the ThinKom (2Ku) antenna achieves about 1.5 times the spectral efficiency as a competing 2-axis antenna along typical routes. The ThinKom antenna may perform even better in the tropics, where the elevation angles may be highest. The ThinKom antenna can operate without any performance reduction due to skew angles that may be encountered in the tropic regions, unlike a 2-axis antenna which may suffer severe degradation. Theoretically, these same benefits await other flat-panel antennas. 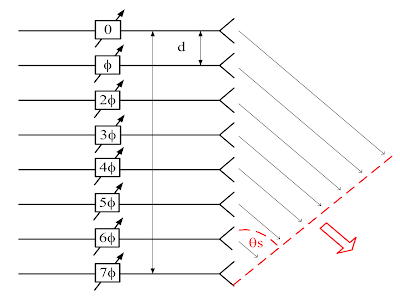 Practically, no other antenna has made public, legitimate claim to a design matching instantaneous bandwidth, efficiency, robustness, and scan loss, in the same size package. VICTS weakness is cost, weight, form-factor; all of which electronic phased array may have advantage. Defense-in-Depth is a security concept that applies successive barriers to unauthorized access. 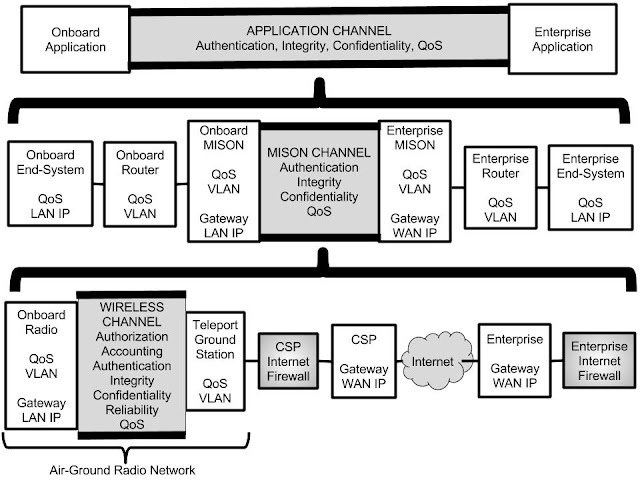 Aeronautical communication includes a Commercial-off-the-Shelf (COTS) layer, a Network layer, and an Application layer. Robert (Bob) Montgomery participated in the Space Shuttle Approach and Landing Test program, conducted by NASA Dryden at Edwards in 1977. 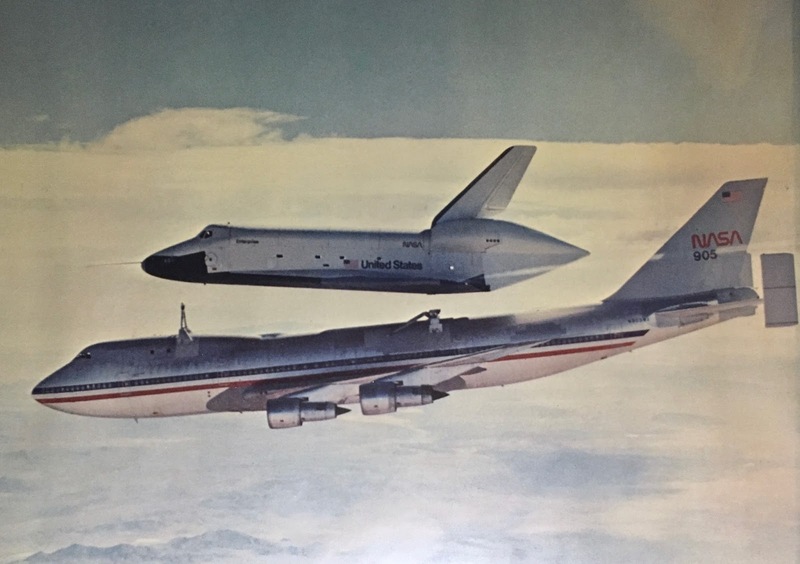 A Boeing Aerodynamicist, Bob conducted wind tunnel test to develop the control modifications as a result of carrying the Space Shuttle, and devised procedures so it could be safely separated. 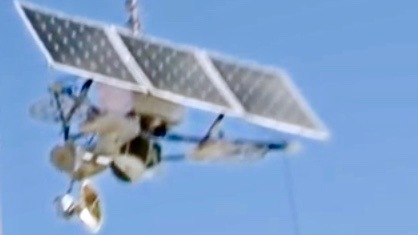 Google is deploying a High Altitude Platform System (HAPS) in the form of balloons that float around 20 km in altitude above a service area. Representative link budgets for both the LTE service and the air-ground unlicensed feeder link show that one balloon can deliver about 10 Mbps uplink and 20-25 Mbps downlink, on average, to LTE subscribers in an 80 km coverage area. Air Transport Airplanes are faced with a monumental challenge to upgrade and embrace modern IP radio networks. Network security has risen mightily to challenge designers, mire down operations, and yet struggles to achieve its goal. Bandwidth management - Quality of Service - is done piece-meal, blind to real priority and performance goals. What will bring this all together? Will air transport airplanes carrying many people for commercial purposes move to fully autonomous, no human pilot onboard? Aircraft fly from a departure airport to a destination airport along a route that is ideally a great circle connecting the two airports. Weather and other aircraft traffic, along with other considerations, can lead an airplane across a range of territory when flying the route from day to day. Airplanes inherently favor flying wings-level while not maneuvering (as opposed to a slip.) This leads to greatest passenger satisfaction and can avoid troubling issues with fluids. As a result, the orientation of the airplane changes with respect to satellites operating along the geostationary orbit (GSO). The relative orientation between satellite and antenna leads to beam steering (azimuth, elevation, polarization skew) commands and also has an influence upon the airplane antenna performance. Airlines have been providing passengers radio communication services at their seat since 1937. In 2017, airline passengers yearn for free and compelling Wi-Fi Internet access. 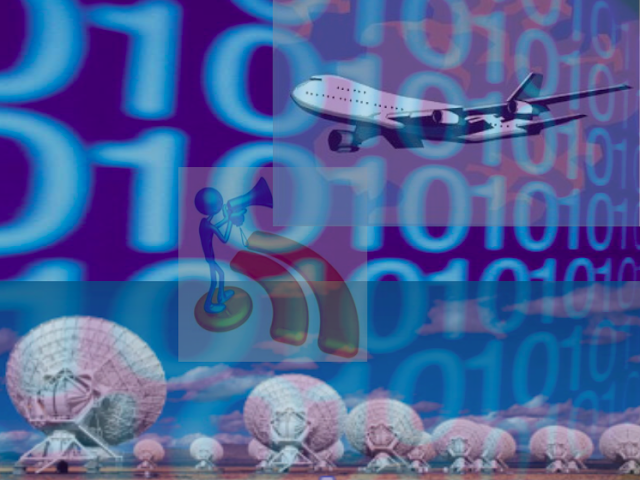 What should an airline consider when choosing an inflight Wireless Internet Service Provider (WISP)? Spectral efficiency –the effective data rate that can be achieved from a given slice of spectrum. The B-47 was the first swept-wing bomber. 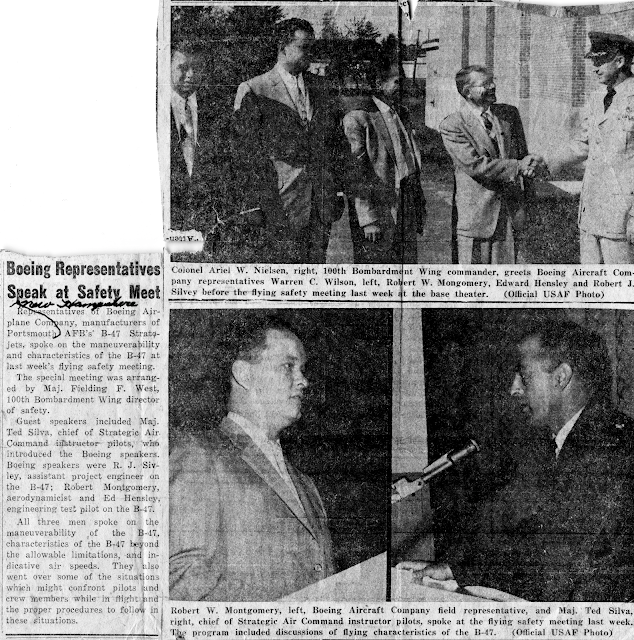 Boeing aerodynamicist Robert (Bob) Montgomery stopped by Pease AFB and briefed emerging maneuvers possible with the B-47. 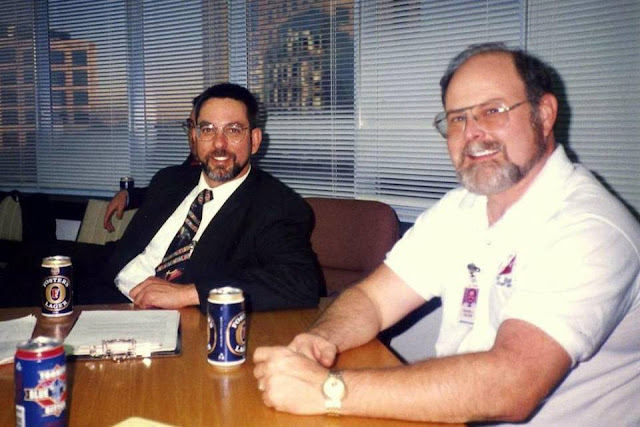 Tom Kraft and Dave Allen share a beer moments after FANS was first certificated by the FAA (1995). David Massey-Greene (QANTAS Chief Technical Pilot) on the other end of the table. Tom Kraft died yesterday in an accident, at his home looking out on Hood Canal. His tragic passing comes less than a year after retiring from a 30+year career at the FAA, leading air traffic control into the digital age. Draft 1 of ARINC Project Paper 848: Secure Broadband IP Air-Ground Interface (SBAGI) has been released by the AEEC Network Infrastructure and Security (NIS) Subcommittee for industry comments. Reports are circulating of person-carrying, fully autonomous, battery-powered drones entering the marketplace later this year. Can it be done safely? 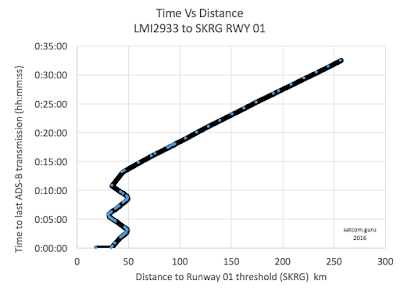 There is a difference in the reported actions (turn left) and the flightradar24.com data (turn right) after commencing a particular missed approach at Sochi in Sep, 2016. The FR24 data offers a climbing right turn, whereas avherald depicts a left turn direct. 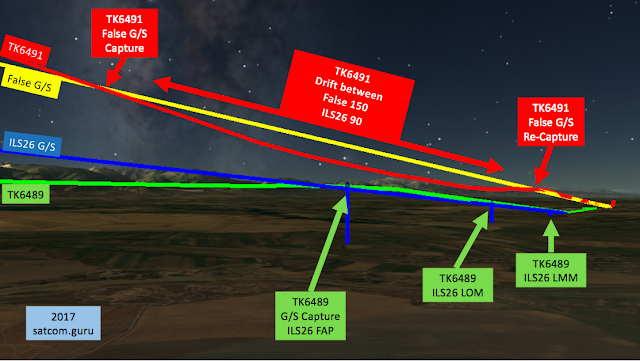 Did a false glide slope lead TK6491 astray? Never have heard of this before. A 747-400F cargo plane with 4 crew crashed near Manas Airport, in a residential area just past runway 26 at about 07:18 local time (2017 01 16 0117Z). All aboard and 35 on the ground perished. An Aeroflot A321departed runway 24 at UMKK Kaliningrad on Jan 03 2017 20:54. Weather reports include forecast medium braking in wet snow, poor visibility, low ceilings with thunderstorms in the area, and a heavy crosswind. The airplane ended up on the right side of the runway, about 5,500 feet from the runway threshold. The crosswind was from the right, so the airplane deviated into the crosswind. Runway 24 is 8202 feet long at 31 feet MSL. Connected Airplane 2017 - Are we there yet? 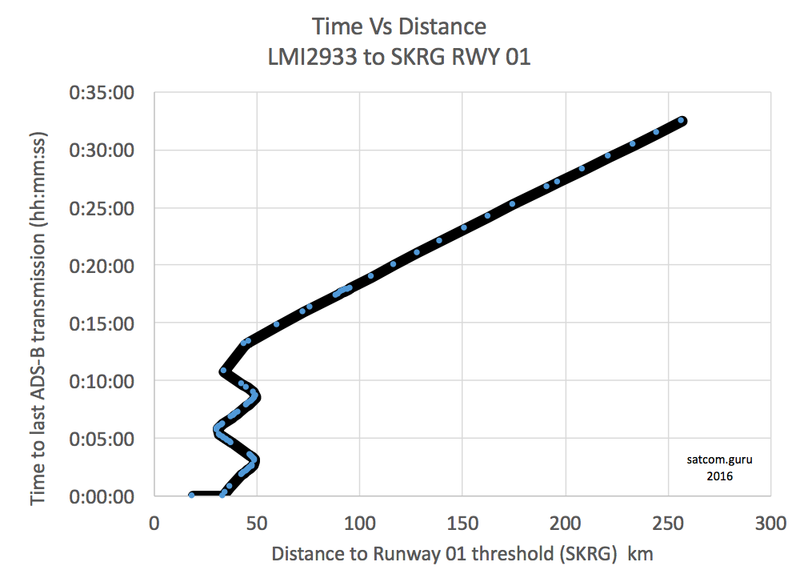 LMI2933 approach to SKRG. The airplane position is plotted as a function of time (where it effectively flows to the left). The airplane initially arrived with conceivably enough fuel to complete the approach and landing safely. 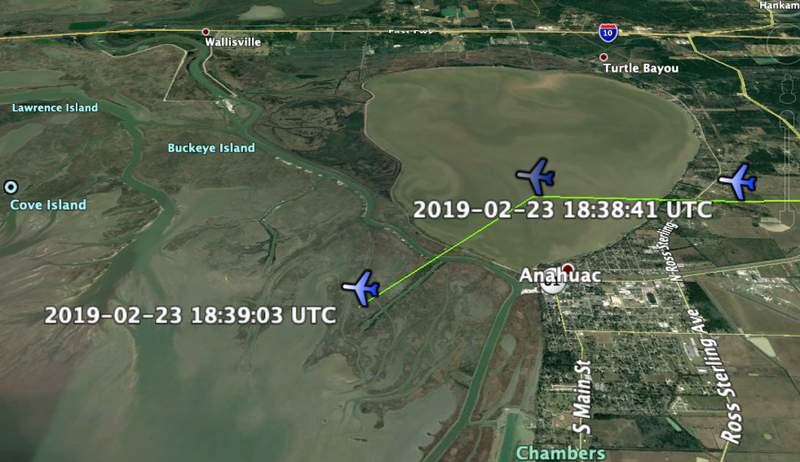 The airplane entered a holding pattern and on the back side of the second circuit departed the holding pattern with apparently total engine failure. The Tacoma Narrows Bridge opened to fanfare in July, 1940 having been constructed over the previous two years as a Public Works Administration Project. The bridge donned the name "galloping gertie" during construction, giving to its narrow profile and insufficient stiffness. The bridge famously collapsed on Nov. 7, 1940. 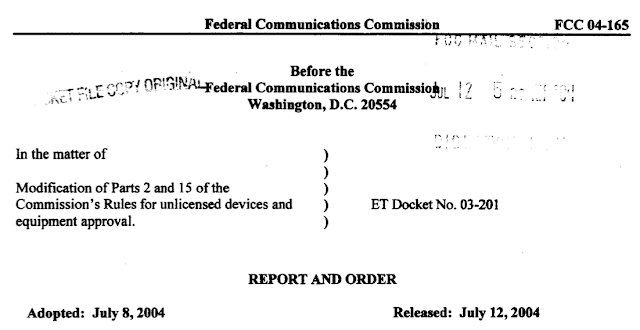 The FCC issued Report and Order 04-165 on July 12, 2004. The Smart Antenna System (SAS), capable of forming multiple antenna beams, forged a pathway to frequency reuse and ultimately powers the unlicensed air-to-ground networks being developed by SmartSky Networks and Gogo. 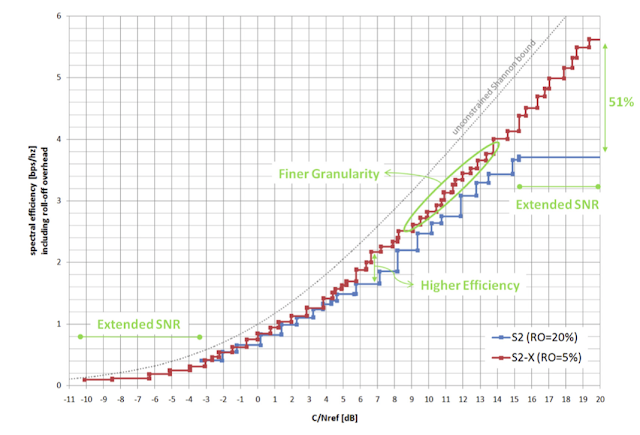 A review of the FCC 15-247 offers an understanding of an overall system architecture and performance estimates.